Gary is very intentionally designed to look like a very stereotypical nerd (seriously, taped glasses? ), so this comic may feel like a betrayal to my nerdy roots, but it's worth noting that this comic also implies that this guy went on at least one date with Nanase. That has GOT to be worth some sort of geek cred regardless of how many people she's apparently dated. Huh. You know, I mentioned a purse database in a previous commentary, and perhaps I really do need one. I know for a fact that I sketched Grace's purse sitting next to Tedd, but I apparently forgot to ink it. I suppose it could just as easily still be there and obscured by the table and Tedd, but that's still going to bug me. There are more restaurant chains than one could possibly count (at least three) you could compare wherever the heck they're eating to, and I wanted it to be recognizable as such, but I also didn't want backgrounds so complex that they distracted from the foreground and/or would take approximately 10,000 hours to complete per panel, so easily reusable low-contrast framed pictures it is. HUZZAH! 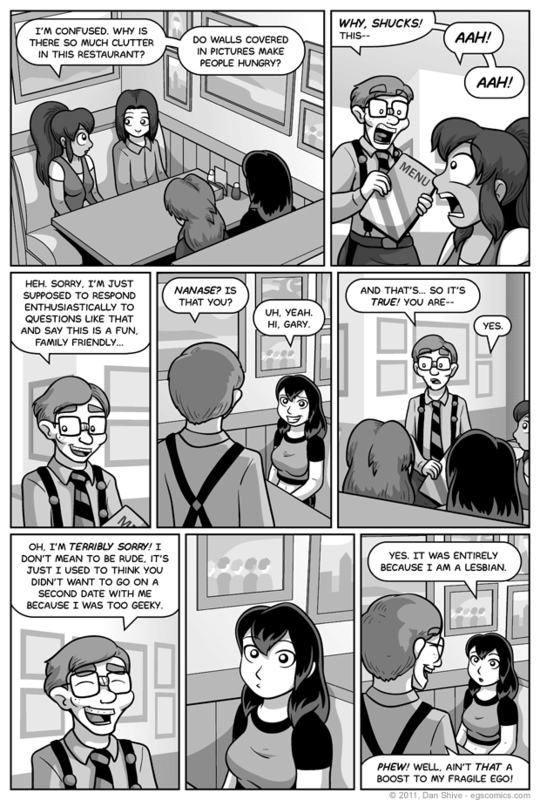 At one point, however, I was having such difficulty deciding on what to clutter the walls up with that I almost changed Grace's line to reference the restaurant's loud music, which is always a tricky thing in a comic, what with there being no sound to speak of. Seriously, what sort of idiot cartoonist makes music a key point in a comic? Honestly.